What are the eligibility requirements to attend RT Alderman School and train with the National Sport Academy? A student going into grade 5, 6, 7, 8 or 9 must apply to participate in the Science Program at RT Alderman School. 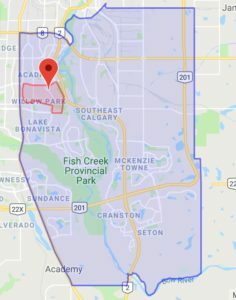 RT Alderman School catchment area is identified in blue. Complete the National Sport Academy application ( the web link for the online application will be emailed upon request). Attend a current National Sport Academy ice session where an on-ice assessment will take place. Meet with the National Sport Academy coaches (usually after the on-ice assessment) to review the National Sport Academy program and how it operates. How many ice sessions do the student athletes have throughout the year? National Sport Academy Hockey targets 55 ice sessions per year but recognizing there may be school field trips etc. 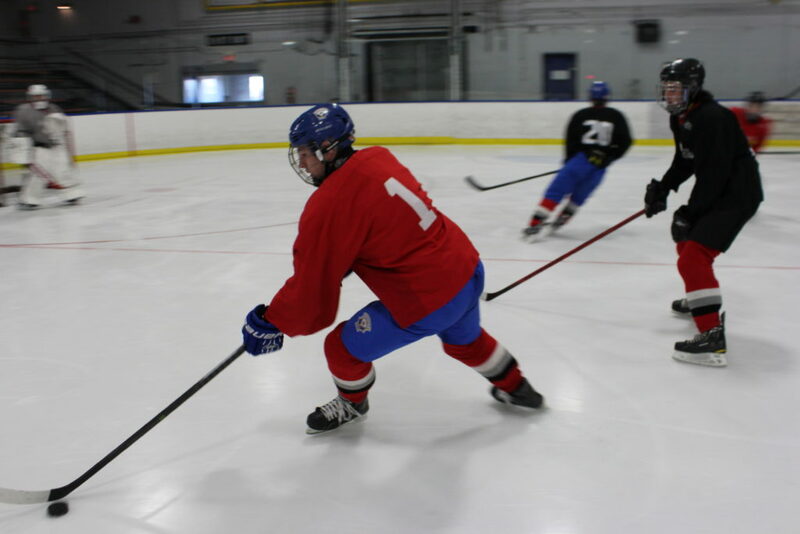 that may result in some students being unable to attend all of the ice sessions, we schedule closer to 65+ ice sessions throughout the fall and winter and 4 – 6 ice sessions in the spring. 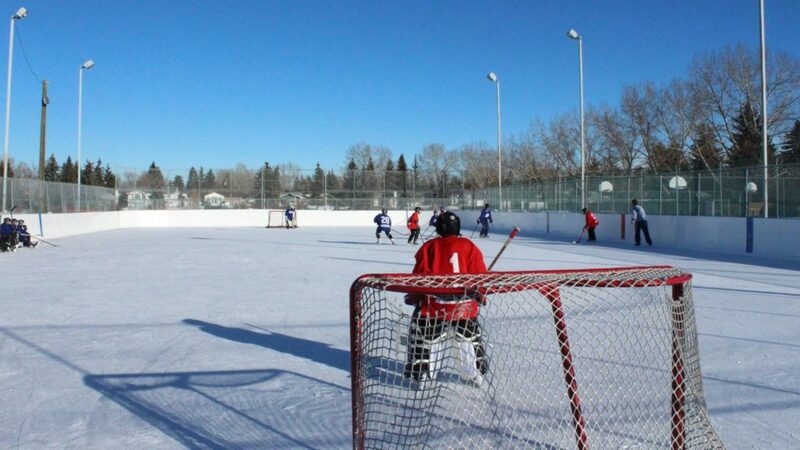 Although our target is 55 ice sessions we are usually at 60 – 65 ice sessions or more by the end of March. Multi-directional skating & skating agility in order to effectively go away from traffic & pressure and find open ice. Skate from the waist down (so you can handle the puck from the waist up). Battling skating (in addition to straight line skating) to work effectively in tight spaces with traffic and pressure. Powerful skating – powerful long strides. It is critical that each player develop sound skating mechanics in order to execute the skating skills required to compete at a higher level and in preparation for combining skating with high level puck handling skills. Handling the puck around the body to create many points to release and receive the puck. Develop width and depth in puck handling to increase the ability to release and receive the puck from various points all around the body for puck handling, passing & shooting. This is no easy task and takes repetitions over many years to become competent. Develop & reinforce proper puck handling mechanics on the journey to develop high level puck handling skills. It is important to continue to develop high level puck handling skills combined with continuing to develop high level skating skills in order to develop high level individual skills and tactics necessary to be creative, innovative and deceptive. 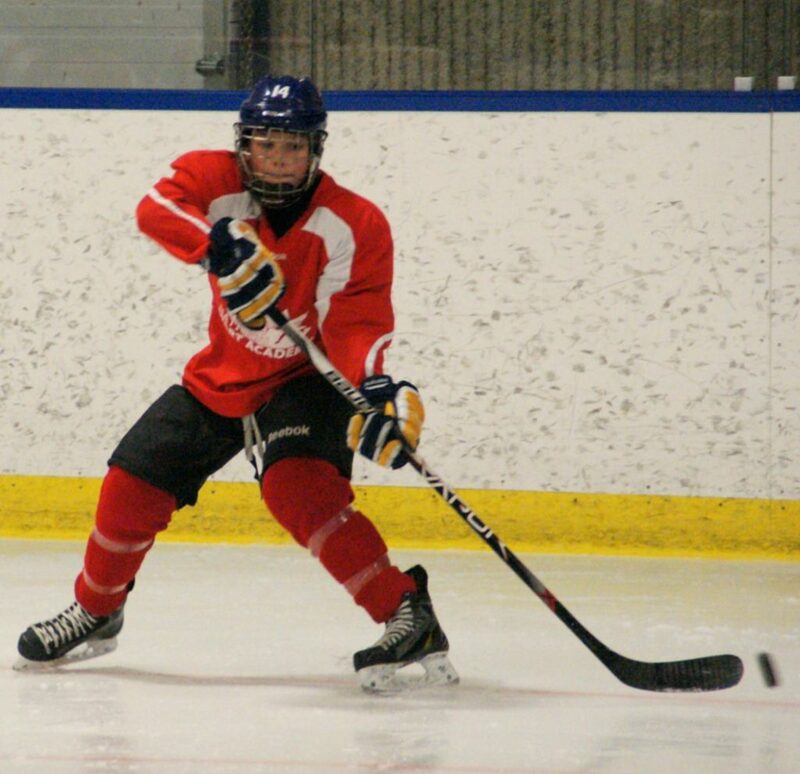 Including the mechanics of puck handling required to pass the puck, National Sport Academy Hockey student athletes continue to develop good Hockey IQ to play away from the puck and the most important offensive team tactic – puck support. Team speed and team change of speed. Width & depth in attacks / multi-directional attacks, multiple attack options. Creative and innovative attack options for increased scoring opportunities. Puck support that provides teammates with pass options and the ability to be deceptive. Improve all shots through purposeful practice. Repetition, repetition, repetition to become an excellent shooter and goal scorer. Release the puck from various release points around the body. Improve release – quick and deceptive release. 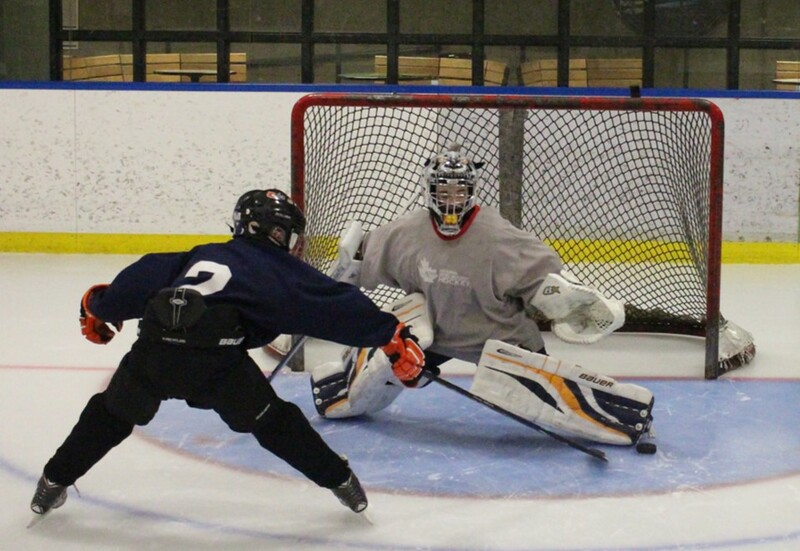 Combine shooting with movement, skating agility and puck handling to be a deceptive shooter and goal scorer. Become a goal scorer by practicing in competitive game like situations. Effective checking – good positioning and leading with the stick. Checking is everything we do individually and as a team when we don’t have the puck. Continue to develop (or introduce) the 4 steps of checking with a focus on the first three steps for the younger grades and all four steps for the older grades. Similar to the higher levels of hockey, knowing how to check – to maintain defensive side positioning, knowing when to pressure and when to contain and having a good stick are just a few of the skills necessary to play the game when you and your teammates don’t have the puck. Improve on preventing opposition scoring chances and regaining puck possession so your team may go on offence. Competitive small area games – the practical application of developing skills and tactics. It is important to work on advanced skills and tactics in a controlled setting but they must also be taken to a competitive game situation where they can learn how to use them. Competitive small area games and competitive situations within the National Sport Academy ice sessions provide the opportunity to learn advanced skills and tactics, make mistakes, go do it again and get the coaching and repetitions to achieve improved skills, tactics and Hockey IQ that can be used with their club teams. How does the National Sport Academy training impact the student athlete’s academic classes? On days when the National Sport Academy trains at Southland Leisure Centre, the student athletes are bussed back to R.T. Alderman School and will arrive back at the school at about 9:20 am. R.T. Alderman School has created a flexible period in period 1 for the National Sport Academy student athletes. In addition, to meet the needs of these student athletes, a culture with the teachers in the school has been created to accommodate these student athletes. When the student athletes complete training in the morning and return to RT Alderman School, they become regular students at R.T. Alderman School and receive all of their core subjects, Physical Education as well as all of their options. Do the National Sport Academy student athletes take their academic classes as one group of students? The National Sport Academy student athletes are integrated into the general population at R.T. Alderman School and only come together in the mornings for the National Sport Academy training. How do the student athletes get from Southland Leisure Centre to R.T. Alderman School after training? Student athletes are bussed back to R.T. Alderman School. How do the student athletes move their hockey equipment from R.T. Alderman School to the training facility at Southland Leisure Centre? Student athletes must each have a second set of equipment they store at Southland Leisure Centre in a heated secure storage room. 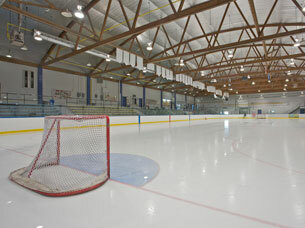 Equipment such as skates, helmet and gloves, the student athletes will usually transport back and forth in a sport bag and store in at R.T. Alderman School. Few, if any, student athletes use 2 pair of skates and we don’t recommend it due to the cost and unique rocker on each pair of skate blades. Student athletes will bring their skates (helmet and gloves) from home to Southland Leisure Centre, access their equipment from the Southland Leisure Centre storage room, get dressed and train. After the ice session, they will place their equipment back in the Southland Leisure Centre storage room and take their skates (helmet and gloves) back to school to store at the school in order to take their equipment home at the end of the day. If you are a goaltender, please let us know and we will explain how the equipment is handled. Is transportation provided to R.T. Alderman School in the morning and at the end of the school day? How do student athletes get from home and to and from R.T. Alderman School? National Sport Academy training occurs in the morning before school so, parents are required to transport their student athlete to the training location at Southland Leisure Centre (ice and strength & conditioning) or R.T. Alderman School (Coaching & Leadership and strength & conditioning). 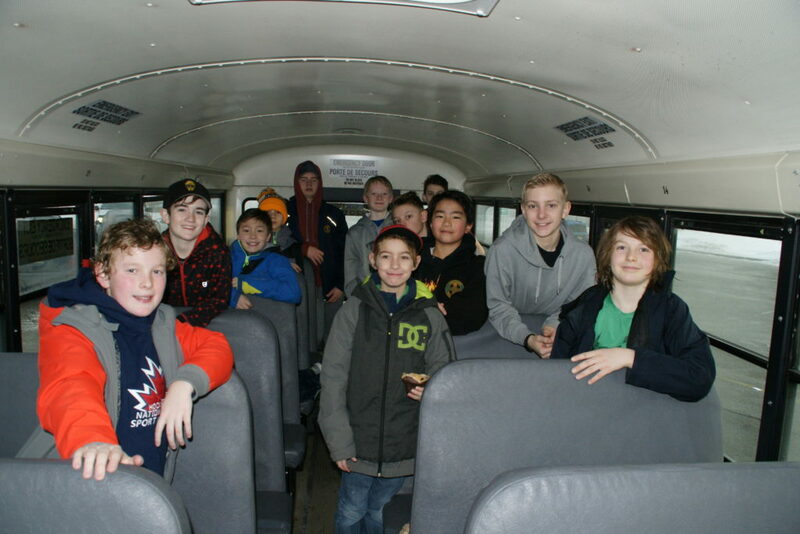 After training at Southland Leisure Centre the National Sport Academy provides bus transportation for the student athletes back to R.T. Alderman School.If R.T. Alderman School is your designated school, you would be eligible for CBE transportation after school. How do we receive feedback on our student athlete’s progress in the National Sport Academy? National Sport Academy Hockey coaches are available to meet throughout the year when they are not leading training sessions with student athletes. In addition, there will be times throughout the year when we have scheduled individual coach / parent meetings that we hope you will attend. We know these dates and times won’t work for everyone so, we can’t stress enough that we can meet at any time the coaches are not working with student athletes. Who do I contact for more information about the National Sport Academy?